If you have tracked changes in Flare, you can preserve the changes so they are visible when you generate Word output. You may want to use tracked changes in a Word document for a number of reasons. The most common reason to use tracked changes is for internal review processes. 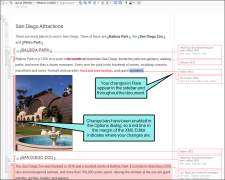 For example, if you have many reviewers who only review content occasionally, you may want to use tracked changes in Word so the reviewers can use familiar software. This may help to speed up the review process. 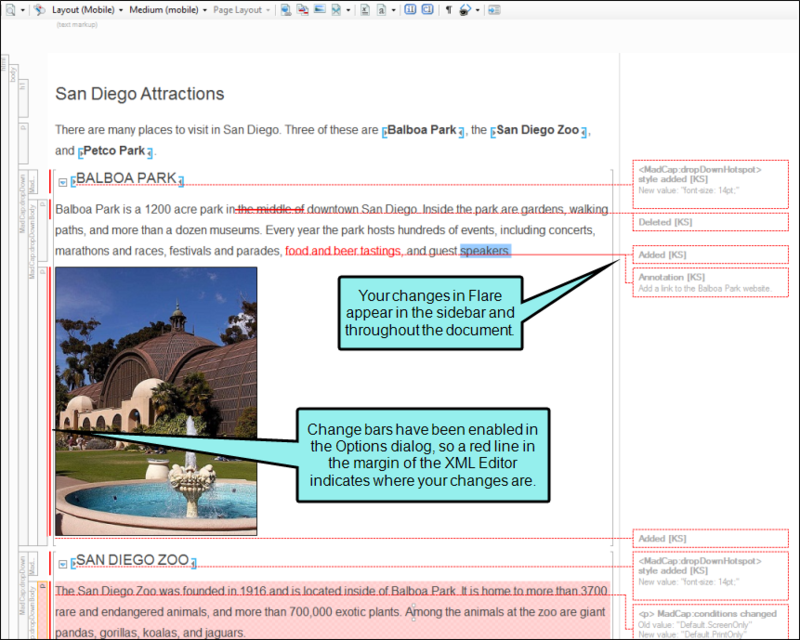 Another reason to preserve tracked changes in Word is if you need the reader to see changes in a document. By preserving changes in Word output (and by using change bars, if necessary), the reader can easily locate new material. When you produce Word output from Flare, the following changes are preserved. Note: Several items are tracked in the margin (using Word's built-in change bars), including proxies, images, equations, keywords, QR codes, and variables. Note: If a change consists of multiple attribute changes, only the final attribute change is shown. Likewise, if you have multiple endnote or TOC proxies in your document, only the final one is shown. Note: Divs are added to Word as tables. Note: Page numbers in relationship proxies are not tracked. Note: Running Head variables (Running HFs) are not tracked as changes. If you want to automatically track any changes made to the Word document after you open it, you can enable review mode in the Word output. This will automatically enable the Track Changes feature in Word. See Enabling Review Mode in Word Output. If you enable review mode in the output, Word will automatically track any additional changes you make in the output. Note: If you preserve tracked changes in Word output, change bars will appear regardless of whether or not they are enabled in Flare. This is a function of tracked changes in Word. See Changing the Display of Tracked Changes. Note: Title page layouts affect auto-generated TOCs in Word. If your Flare project includes a title page, and you selected the "Generate TOC proxy" option in the Target Editor (see Auto-generating TOCs for Print) the auto-generated TOC will appear after the title page. If title page is not specified, the auto-generated TOC will appear at the beginning of the output. Additionally, although the auto-generated TOC is considered a chapter break, it will use the same page layout file that is used for the title page. Note: You will see a build log warning if your Flare project uses a header, footer, or body frame that falls outside of the page layout boundaries supported by Word. To resolve this error, you can modify your page layouts in Flare so they are within Word's page layout boundaries. Note: When you generate Word output, divs appear as single-cell tables. This allows you to move the div in your output, resize it, or even add additional rows or columns. Any styling (such as background color) that you have applied to your div will appear in the output. Additionally, you can nest divs within tables or within other divs. Because each div appears as a single-cell table, you can resize or edit each nested element individually. Divs also support borders, float properties, and autonumbering. Note: When using divs, styling, such as borders or background colors, must be applied to the div (not to the paragraph tag within the div) to appear in the generated Word output. Note: When generating Word output, autonumbering is preserved for divs, keywords, concepts, empty tags, and other non-text elements. Note: Flare does not support background images in generated Word output. If you use background images (e.g., in a note div, in a cover page layout), you can apply them in Word after generating the output from Flare.